Ayala Land is firmly committed to good corporate governance as a critical element in creating and sustaining shareholder value while considering and balancing the interests of all our stakeholders. We believe that adherence to the highest standards of corporate governance is integral to our creation of shareholder value over the long term. 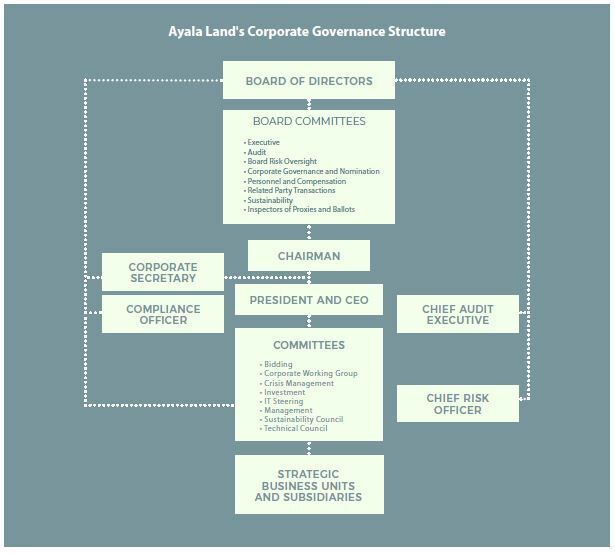 Ayala Land’s corporate governance practices are principally contained in our Articles of Incorporation and By-laws. The company is in full compliance with the code of corporate governance and all listing rules of the Philippine Stock Exchange (PSE) and regulations adopted by the Securities and Exchange Commission (SEC) and the Philippine Dealing Exchange Commission (PDEx).